Or perhaps better known as Chocolate Salami! 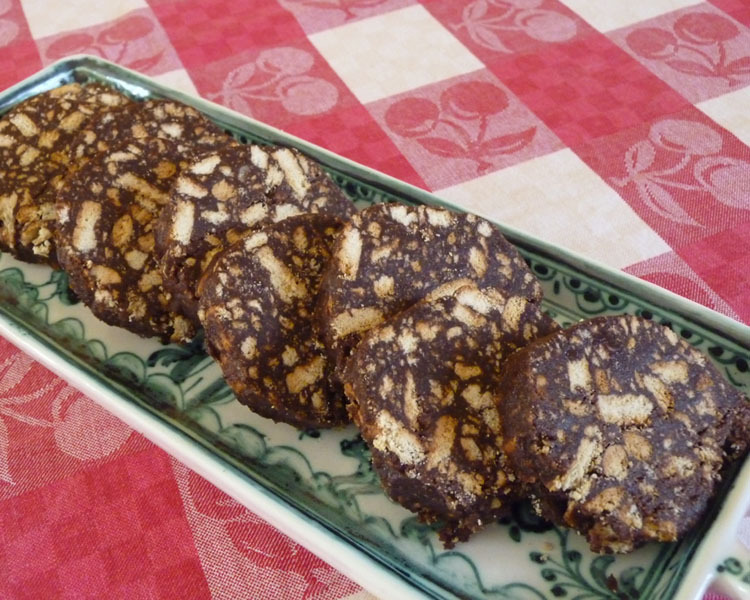 Chocolate Salami is very popular in the Algarve and is a great biscuity-cake to serve with tea or coffee. It’s extremely rich so it’s wise to cut the slices as thin as possible. I can only assume the name comes from its chouriço sausage-like appearance. So after my recent visit to the Feira dos Enchidos Tradicionais de Serra de Monchique (Sausage fair) I thought it would be great fun to make a chouriço sausage, but a ‘Chocolate Chouriço’. It’s extremely simple to prepare and requires no cooking! Add the sugar, chocolate powder and butter to large mixing bowl and beat well. (I did not pay attention to the chocolate powder and when I started to beat the mixture with my whisk, the powder blew into the air and went everywhere, and I mean everywhere! 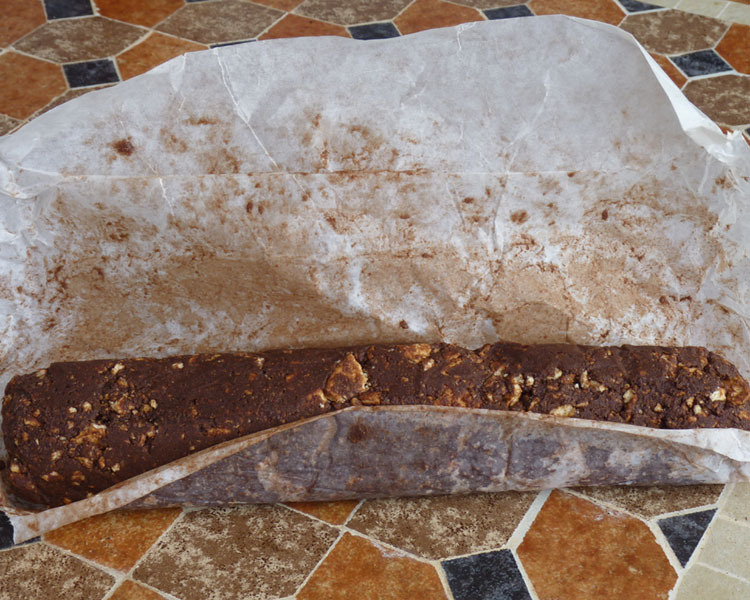 Remove greaseproof paper and cut into 1cm slices to serve. Store for up to three days in the refrigerator (if it lasts that long). Perfect to share with friends with tea or coffee. 1. I made far too much so I cut the chocolate sausage in half, sliced into 1cm slices and then wrapped in individual portions before freezing. Not sure if it freezes well, but would have been sick as a pig if I’d eaten all of this so it was worth experimenting! The only downside of this recipe is that I’m left with four egg whites. Any suggestions please how I can utilize these in other recipes? I want to eat some of that with you over a cup of tea. Sigh. Why not just make a yummy egg white omelet? it looks lovely. Can I make it with cocoa powder rather than chocolate powder as can’t get chocolate powder here? I would make meringues as long as you have a machine to beat them with, then make a pavlova by smearing two circles of meringue onto greaseproof paper and then when cooked fill them with your gorgeous strawberries and lots of thick double cream – trouble is you may end up a tad of a podgy piglet after! Yes you can make with cocoa, but just watch the strength. Is cocoa stronger than drinking chocolate? Not sure. I like the idea of the pavlova. Never cooked one so a good challenge! Might manage this- it’s just about at my level of “cooking”. It looks harder to make than it is! Encourage me, why don’t you? In my house, “bolo de bolacha” is usually made at the same time as “salame de chocolate”, so you use the whites on one and the yolks in the other. The down (?) side of it is the overload of sweets you suddenly get. Salame freezes ok, but I’ve only seen it done in foil. Much to my relief you are right the salame did freeze OK. I cut in to individual slices, wrapped each piece separately in greaseproof paper and then put in a plastic freezer bag. I tried some today. I’d love to come over for a cuppa and enjoy a piece of that yummy biscuity cake with you Carole! I’d be interested to know how it freezes. With the left over egg whites you could make a base for a pavlova, or as a topping for a lemon meringue pie! I’ll be back for some of that if you make it! btw, cocoa is stronger than drinking chocolate. The kettle’s on Barb! I think I will check out the Pavlova 🙂 Haven’t had one for years! Your recipe sounds great and I can’t wait to try making it. Thank you for your post. Hi Karen and welcome 🙂 Hope it turns out well! I can’t be sure, but I think this is what we call Hedgehog in Australia and for us it is square. got egg whites? … a good old famous New Zealand Pavlova of course!!!! Oh I would love a slice please, it´s been ages since I made this, it used to be my kids favourite cake when they were younger. You could try “Farófias” or Clouds, another great Portuguese dessert. If you make a custard with powder from a tin (not the home made kinds as that would use up the yolks). You just need to beat the egg whites with a pinch of cream of tartar until soft peaks form. Add 100gr sugar and beat until stiff peaks form. Heat 500ml milk, 25ml sugar and 1 vanilla pod (or 1 tsp vanilla essence) until just simmering. Remove the pod. Poach spoonfuls of egg white mixture in the milk for 2 minutes on each side. Remove with a slotted spoon and drain on paper towel until all egg whites finished. Make a custard which you pour into a glass serving dish and arrange the egg white clouds on top. Dust with ground cinnamon or caramel sauce. You can darken the clouds under the grill for a few seconds if you like. Also delicious and a childhood favourite. In fact a friend just make it for my birthday last week and it brought back memories. Thanks sami, I’ve never seen this dessert before. I will give it a try…watch this space. You can use egg whites just like regular eggs in baking or cooking. I think the equivalent is 2 egg whites = 1 whole egg. A bonus is that egg whites are supposed to be better for you than the yolks are because of the cholesterol in the yolks is higher or something like that. You may want to look that up to see for sure. I’m so tempted to try this recipe but use applesauce instead of the raw egg yolks. I don’t know if it would work for sure, but it would be worth a try. For the most part, in my neck of the woods, raw eggs are no-no for fear of salmonella poisoning. Cripes never thought about raw eggs! Would the eggs bind the mixture together? not sure. Be interesting to see if apple sauce works…Maybe marmalade would work? It must be the egg yolks that bind it! It looks divine PiP! I may have to try this with peanut butter cookies (biscuits, as you would say). I love peanut butter and chocolate together. PiP, you had me at “chocolate”! I’ll have to attempt one of these delectable beasts. Enjoy Rose 🙂 Be interesting to see how you get on! Looks yummy, might try it sometime, all I seem to make these days is banana bread! I love Banana bread…especially with walnuts in! PIP, chocolate sausage…a dream come true! Beat the egg whites with a pinch of lemon. Add sugar and beat until stiff peaks form. Heat 500ml milk and some sugar until just simmering. Poach spoonfuls of egg white mixture in the milk for some minutes on each side. Remove with a slotted spoon in to a bowl, when all the egg white mixture is “cooked” pour in the remaing milk to the bowl and add cinnamon. Hi Fernanda, you are right it does resemble morcela sausage! It is always great to receive feedback – thank you! I made macarons with my egg whites with my cooking club in February. They definitely took alot of technique to master. I know these by their more prosaic moniker – refrigerator biscuits! Yours look fantastic with their marbled appearance! What to do with egg whites? Macaroons or meringue! I am going to try Farófias and meringue!